Here are the details of your Valentine Husband Husband card, Remember we can post it directly to you or your chosen recipient with your own personalised message. The price includes free UK delivery. 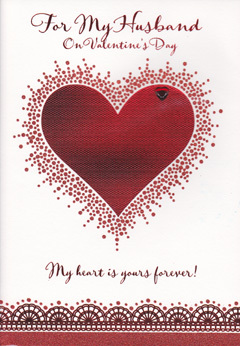 A very beautiful bright and bold open valentines day card, beautifully embossed, featuring red metallic detail in wording and design together with soft shimmery glitter detail with a lovely little red heart gem on card.